For some people, neck pain is a common occurrence. In fact, chronic pain afflicts 100 million Americans according to the American Academy of Pain Medicine. Of that 100 million, approximately 15 million are experiencing neck pain. Do you wake up in the morning with neck pain and struggle with it throughout the day? 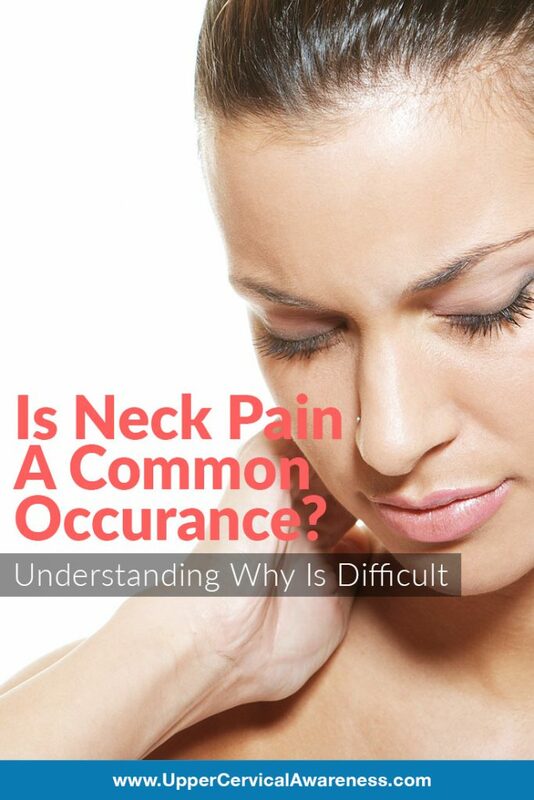 If so, you will be happy to learn about a natural way to deal with chronic neck issues. But before introducing this alternative therapy, it is important to understand what causes neck pain. This will lead to a better understanding of how to correct it. Bone or joint abnormalities: This may happen if a person is straining the muscles or causing tension by overusing them. For example, sitting in front of a computer all day looking at the screen at an awkward angle, sleeping in the wrong position, a fall, over exercising, or other similar actions can lead to bone or joint problems. Incorrect posture: Poor posture leads organs and tissues to shift due to uneven weight distribution. The spine compensates for this. Neck pain is the end result. Head or neck trauma: The top seven vertebrae are known as the upper cervical spine. If these bones become misaligned due to such things as whiplash, a concussion, or another head or neck injury, they can be the source of neck pain. Neck pain is often associated with shoulder pain, headaches, migraines, and tingling and numbness in the extremities. Neck pain may seem to pop up out of the blue. However, there is usually a connection to something that happened – either recently or many years ago. A car accident, a sporting injury, or a fall can all be reasons for pain in the neck region. We’re going to take a closer look at a few causes of neck pain that are particularly prevalent in modern society. The Washington Post wrote an expose on what is being referred to as text neck, although that term has not been adopted as an official diagnosis by the medical community. Basically, the idea is that our mobile devices are causing neck problems by changing our posture. The human head weighs 10-12 pounds and constantly exerts this weight on the neck while at a 0-degree angle. At a 15-degree angle, the head exerts about 27 pounds of pressure. At a 30-degree angle, the head exerts about 40 pounds of pressure. At a 45-degree angle, the head exerts about 49 pounds of pressure. At a 60-degree angle, the head exerts about 60 pounds of pressure. That alone may make you think twice about craning your neck rather than raising the phone to eye level. Here’s another study to add to your list of reasons to quit smoking. According to researchers in California, smoking cigarettes has been linked to cervical degenerative disc disease. Even when the difference in age of the 182 participants in the study was accounted for, active smokers still had a significantly higher degree of degeneration of the discs that keep the neck vertebrae from rubbing together. Once the discs that separate the cervical vertebrae degenerate to a certain degree, chronic pain becomes difficult to correct. Stress is another major factor resulting in neck pain, shoulder pain, and even headaches. How does stress cause neck pain? When the body is stressed, blood vessels are enlarged. This is a positive reaction designed to provide more oxygen to the largest muscle groups. It can give you that boost you need to survive an emergency event. Unfortunately, the stress reaction also leads to the tightening of muscles in the neck as well as the shoulders, and jaw. The trapezius muscles in the back tighten up, which can also pull on the neck. Neck and shoulder movement are restricted as a result. In this heightened state of awareness, pain levels increase in the body, and that pain can add to the stress, creating a cycle that is difficult to overcome. Exercise – Exercise allows you increase blood flow in a positive way. Hormones are also released in the body that make a person feel better. Exercise may actually reduce the degree to which a person feels pain. Healthy Lifestyle – Smoking, overuse of alcohol, and high levels of caffeine can all add to the stress. Being moderate in your personal habits can go a long way toward reducing stress levels and pain. Learn to Relax – Whether you use a stretching routine, learn deep breathing, or just sit down with a good book, learning to relax when tensions rise is important if stress is starting to have physical effects. Sometimes it just means learning when to say no or when to take a short break during the day. Talk to Someone – It doesn’t have to be a therapist (although there is no shame in doing so), but find someone to talk to about what is stressing you. It may be a spouse or close friend. You may even find an online support group for people dealing with your particular type of stress. Getting to talk things out in a judgment-free environment can be important. Neck pain is a common cause of disability. As a result, the neck pain disability index (NDI) was developed to determine how disabled a person is by his or her neck pain. NDI is measured on a scale of 1 (no disability) to 100 (total disability). Also, the NRS (number rating scale) is a measure of pain based on a rating of 0 (no pain) to 10 (the worst possible pain). These two scales were used to determine the effects of low force upper cervical chiropractic care on patients with chronic neck pain. The study involved 60 neck pain patients who had to meet several criteria. First, the patient had to have neck pain as the primary complaint (not neck pain as part of another condition like fibromyalgia or MS). Another factor involved having a detectable difference in leg lengths during a supine leg check. This would indicate the likelihood of an upper cervical subluxation (misalignment of the C1 or C2 vertebra). Plus, the misalignment needed to be confirmed using diagnostic imaging techniques. NDI (disability) was reduced from an average score of 33.8 to 21.2. NRS (pain) was reduced from an average score of 5.92 to 2.23. NDI (disability) was reduced from an average score of 35.4 to 12.7. NRS (pain) was reduced from an average score of 5.89 to 1.64. These results show that when an atlas misalignment exists along with neck pain, positive benefits can be achieved quickly by means of gentle upper cervical adjustments. Neck pain is often treated with pain medication. These medications have a tendency to result in dependency. Some have even discovered that prescription pain medication for neck pain later became a gateway to illicit drug use. However, in a 2015 study, upper cervical care once again produced positive results and with no serious side effects. In this study, 62% of patients who sought upper cervical care for neck pain found significant benefits in just 17 days or less. The patients in this study were not limited to just those with neck pain as a primary symptom. In fact, many MS patients saw dramatic benefits in neck pain relief. This makes upper cervical care a potential source of pain relief for those suffering neck pain regardless of the underlying cause. It may be particularly beneficial for those seeking drug-free care or those with a history of head or neck injury. Even the slightest misalignment of the upper cervical spine can affect the nerves, muscles, and other soft tissue of the neck in a negative way. This, in turn, can have a top-down effect, leading to one shoulder being higher than the other, one hip being lower, and a difference in leg length. As a result, shoulder or back pain may accompany the neck pain, or the pain may seem to move around. Headaches too have been connected to neck pain. Since upper cervical misalignments can lead to inhibited blood flow to the brain or pooling of cerebrospinal fluid, it is not uncommon for these symptoms to occur together when a misalignment is in play. Gentle Care – Low force corrections are made manually or using a chiropractic adjusting instrument. This is very different from the twisting or popping motion used by general chiropractors. Therefore, little is felt during the actual adjustment itself, and the body is not subjected to the additional trauma of a sudden head movement. Corrections can hold for a long time and give the body the opportunity it needs to heal soft tissue damage. Thus, in the case studies above it was noted that benefits occurred in just 14 to 17 days. Precision Care – While most chiropractors will take x-rays before adjusting a patient, the diagnostic imaging used by upper cervical chiropractors is more exacting. The atlas location may be measured to hundredths of a degree to provide a customized adjustment for each patient. Once again, this leads to corrections that hold in place longer, not only giving the body time to heal but making this a cost-effective option. Adjustments are provided on an as-needed basis, so if you go for an exam and the atlas has not shifted, you won’t be adjusted. For these reasons, many enjoy the upper cervical chiropractic experience, even those who are not fans of general chiropractic. Upper cervical chiropractic is gaining momentum as research reveals the benefits. If you are suffering from chronic neck pain why not give upper cervical care a try before resorting to more drastic measures. You may even find that the relief you get lessens not only the pain but also the degree of disability caused by the pain. The upper cervical approach to health care is a holistic (whole body) approach to wellness, that can be beneficial for the whole family since adjustments are gentle enough for babies or the very elderly. To learn more, contact an upper cervical practitioner near you and schedule a consultation.